TADA!!!!!!!! I couldn’t believe how perfect the cookie came out!! I can’t say they’re similar to the cookies at Starbucks, but this had it’s own charm. The spices were prominent but not overbearing, and the cookies had a nice crunch on the outside, whilst still being delectably chewy on the inside. I seriously could’ve finished the whole batch (yes, the whole dozen of cookies) if I hadn’t quickly packed them up to give away to my parent’s colleagues and people I met up with the next day. All this baking is seriously going to sabotage my “healthy diet” plans, haha. By the way, hopefully this will be the last post with sub-par quality photos… Sony just released a software update (ver 10.1.1.A.1.253) and they seem to have improved the camera performance 🙂 Shall be testing the camera more to see how it turns out. But I guess all the latenight baking means I’ll never have optimal lighting for nice pictures anyway… Ha. Preheat oven to 350*F (175*C). Line a baking sheet with parchment paper. In a big bowl, whisk to combine the flour, baking soda, salt, ginger, cloves, nutmeg and cinnamon. In another bowl, cream together the butter and sugar until combined. Add the egg white and whip until smooth, then add the molasses. Mix in your dry ingredients until the flour just disappears. Portion out the cookie dough into 12 balls, and roll them in granulated sugar. Bake the cookies for 15-20 minutes. Or until cookies “spring back” when touched. Allow the cookies to set before transferring to cooling rack. I added the nutmeg and cinnamon to add to the depth of flavour but you can omit them if you don’t have them on hand already. 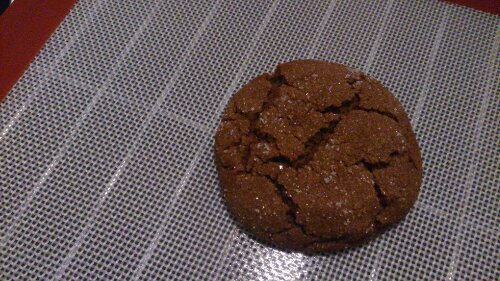 This entry was posted in latenight baking, recipes, slice of life and tagged baking, cookies, ginger molasses cookies, latenight baking, recipe, slice of life, starbucks, success. Bookmark the permalink.